Every week at Clarion, we send round an update to our clients on the cleverest bits of PR and marketing that we’ve found that week. We call it ‘Clever Stuff’ because we like to keep things simple like that. Once a month, we’ll be highlighting the best of the best, the smartest of the smartest. So, welcome to the inaugural edition of the Cleverest Stuff! In March’s edition, we’ve got primal colours, Del boy himself, THAT Nike ad, and even a bit of Dean Gaffney, lovely jubbly. UKTV Gold. You might know it as the channel your grandparents insist on having on, but recently they’ve played a blinder (almost literally) that everyone was talking about. 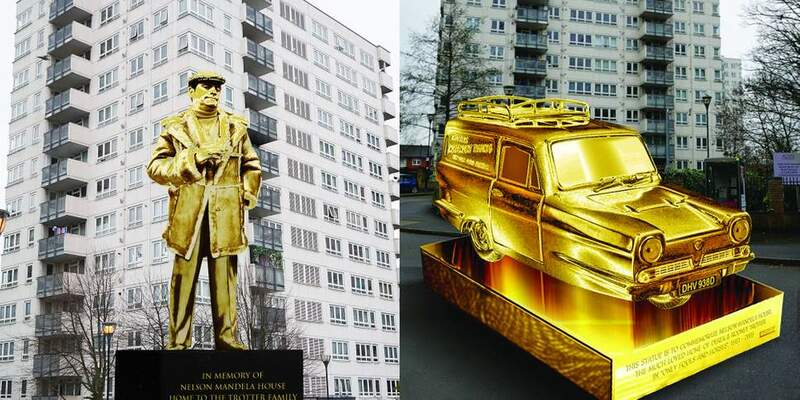 Gold launched a public petition to install an Only Fool’s and Horses themed statue outside the London tower block that housed the Trotter brothers, following news that the site is set to be demolished. They even got John Challis AKA “Boycie” in on the action, with the actor sending a video in support of the petition. What? You didn’t think we were going to talk about the cleverest stuff that’s happened in March and not mention something we worked on? To celebrate the launch of their ‘Love Your Colour Guarantee®’ and get media talking, Valspar created the ‘Institute of Primal Colour’. The experience took the audience on a multi-sensory journey through a series of chromatic experiments, which were developed by the University of Oxford. The study was designed to help consumers discover the perfect paint colours for their home with participants also treated to an individual chat with a professional colour consultant. To top it off, there were cocktails of every colour, which you could discuss your findings over. Bleedin’ marvellous. International Women’s Day was last month, and Nike launched its newest ad, ‘Crazy’ ahead of it. Narrated by Serena Williams, the 90-second ad features gymnast Simone Biles, snowboarder Chloe Kim, members of the U.S. Women’s National Soccer Team, fencer Ibtihaj Muhammad, track athlete Caster Semenya, NBA coach Becky Hammon, and many more. It points out commonly held cliché’s about women everywhere whilst showcasing athletes that break that stereotype every day. It’s a bold stance from Nike, who aren’t unaccustomed to releasing thought-provoking ads, after throwing their support behind Colin Kaepernick last year. In fact, if you haven’t watched the advert yet, do it right now. Don’t worry, we’ll wait. Since 2013, Virgin Trains have featured talking toilets, which dole out advice on hygiene and safety when you might need the loo. Last week, they announced the start of a campaign to find the next new voice for their toilet, and who should help launch the promo but the inimitable Dean Gaffney?! Like Dean himself, the campaign is charming, funny and good-natured. Dean unfortunately isn’t allowed to take part in the contest himself, so he won’t be narrating in loos for us any time soon, but the good news is that you could be! The search is closes today, so if you fancy your chances, you need to be quick and visit here.